» What is the concentration of bacterial cells in a saturated culture? 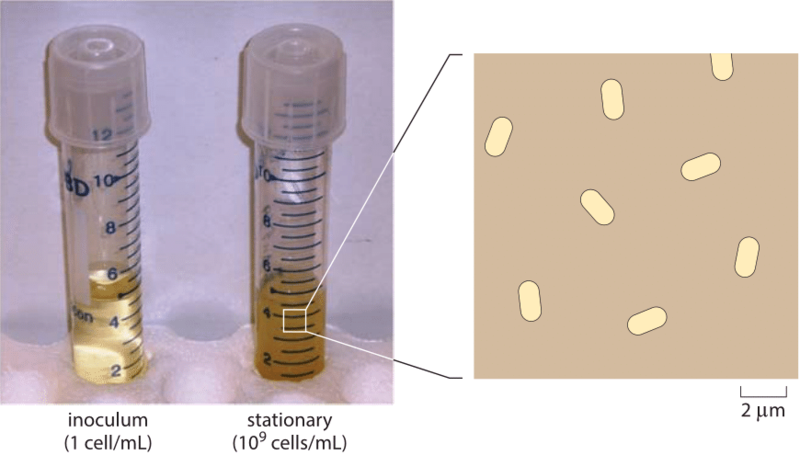 Figure 1: Depiction of the density of E. coli cells in saturation. A saturated cell culture contains about 109 cells per mL. The average spacing is about 10 µm between cells. The blowup is drawn to show a characteristic density at such conditions. In order to represent a three-dimensional situation in two dimensions, the figure shows all cells in a layer about 10 µm thick and the cells rotated to be seen sidewise. When viewed under a microscope, the layer thickness that is in focus is termed the optical depth, and is usually around one to several microns depending on magnification. Figure 2: (A) Scanning electron micrograph of the paunch section of a termite gut. (B) Riftia pachyptila. Scanning electron micrograph showing Gram-negative bacterial symbionts within trophosome. ((A) adapted from (J. A. Breznak & H. S. Pankratz, Appl. environ. microbiol., 33:406, 1977 and (B) adapted from C. M. Cavanaugh et al., Science 213:340, 1981). Once one overcomes one’s amazement at the exponential phase of cell growth in liquid media and the questions it engenders, the next mystery centers on when and why growth abates in what is known as stationary phase. In most labs, the use of overnight cultures is standard fare. The scheme is that an inoculum of several thousand cells is pipetted into a 5 mL tube and then grown overnight. During those 8-12 hours, the transparent and vacant media transforms into a saturated culture as shown in Figure 1 with a characteristic density of cells measured via the optical density at 600 nm (OD600) with a value of ≈2. With a calibration curve or using the collection of characteristic conversion factors shown in Table 1, one can transform the OD value into a cell count of 109 cells/mL (BNID 104831). Under these conditions, the cells occupy about 0.1% of the total medium volume. The mean spacing between the cells is roughly 10 microns, a high density but still not nearly as high as the cell densities in environments such as the guts of animals, which are typically a factor of ten higher (BNID 104951, 104952, 104948, 102396). Examples of the extreme crowding in such environments are shown in Figure 2A, illustrating the crowded cellular environment in the termite gut, and Figure 2B, showing a trophosome – an organ in deep-sea tube worms packed with bacterial symbionts supplying its energy from sulfur oxidation in a biological process completely independent of the sun’s energy. In fact, many biologists make use of such dense environments on a daily basis by growing colonies of bacteria on agar plates. Even in the sediments of the ocean floor the bacterial densities are sometimes as high as those found in a saturated culture as shown in Figure 3. Given that bacteria have become the workhorses of many different parts of the biotechnology industry, it comes as no surprise that massive efforts have been undertaken to push the limits and efficiency of cell cultures. The concentration of cells at the final stages of growth, also known as the yield, is a dominant factor in the overall economic viability of many biotechnology applications. Thus, in industrial fermentors, effort is being made to optimize the conditions to reach as high a yield as possible. Strikingly, yields of about 200 g dry weight/L have been reported (BNID 104943), equivalent to several hundreds in OD units. Remembering that E. coli is usually about 70% water (BNID 100044) this leaves very little except cell mass in these extremely saturated cultures. Indeed, the cell density corresponds to a mean spacing between cells of just over a micron. At these densities, the cells are literally on top of each other. To achieve such high concentrations, methods such as dialysis fermentation have been developed where the cells are separated by a semi-permeable membrane such that low molecular weight excreted products are removed from the growth medium and a fresh supply of nutrients including oxygen is maintained. Table 1: Conversion between optical density (OD) and cell concentrations. CDW is cell dry weight. Yield is the ratio of cell dry weight to mass of sugar consumed. The overall mass balance is that the total sugar mass plus oxygen consumed is equal to the biomass produced plus CO2 emitted and byproducts excreted. Note that values vary with growth rate (based on carbon source etc.). How can such a multitude of bacteria be helpful? There are many circumstances in which we are interested in generating many copies of some DNA of interest. Preparing to transform a cell or in checking the presence of a gene by running the corresponding DNAon a gel are two everyday examples from the lab. Consider again a 5 mL tube of LB media saturated over-night batch of bacteria. It will consist of about 1010 cells. If it expresses a very high copy number plasmid (≈100-1000 plasmids per cell (BNID 103857, 103860)), then there are ≈1013 copies of that gene in the culture. This is roughly the same number of copies as if that gene were present on the genome in each of the cells of our body (BNID 102390). If you need many copies of the gene, then extracting the gene from the bacterial culture will give you as many copies of that gene as would be gotten by extracting from a whole human body.